These are 15 of the unhealthiest meals from U.S. chain restaurants courtesy of the Center for Science in the Public Interest. NEW YORK (TheStreet) -- Most of us enjoy going out with a few friends to our favorite chain restaurant. We like to sink our teeth into a Bloomin' Onion at Outback Steakhouse (BLMN - Get Report) , some boneless barbecue wings at Buffalo Wild Wings (BWLD or soup and a sandwich at Panera (PNRA . But we all know what happens next. We eat the delicious food, we're happy for a few moments and then we ask ourselves, "Why did I just do that?" At some restaurants, this feeling is not as pronounced. But there are a few establishments where you feel like you need to be removed by crane after you finish your meal. The good folks over at the Center for Science in the Public Interest publish their "Xtreme Eating Awards" each year to help consumers learn about what they're walking into when they sit down to eat. We've also added a few other selections to round out the list. If you're brave enough, come take a trip through the 15 unhealthiest meals from U.S. chain restaurants. Prepare to be sad and quite possibly nauseated. Remember that annoying Chili's jingle about wanting "my baby back, baby back, baby back, baby back, baby back" ribs? It gets worse when you learn what exactly it was trying to sell you. 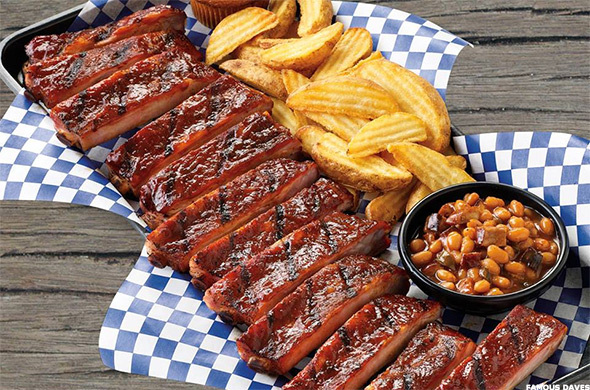 The full rack of baby back ribs at Chili's boasts an impressive 1,630 calories, 85 grams of fat and a whopping 3,290 milligrams of sodium. 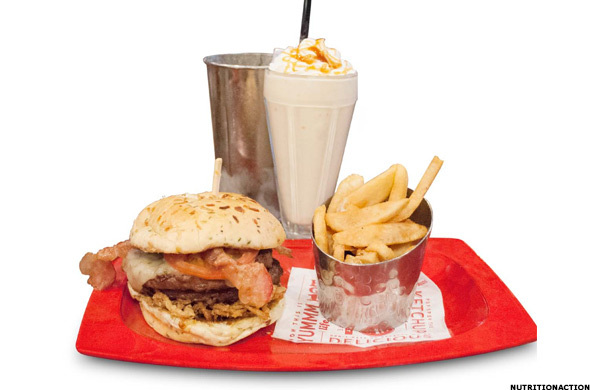 Johnny Rockets offers burgers, fries and shakes in the style of a 1950s establishment, complete with the white paper hats and old-time atmosphere. But a look at the nutrition facts on the food might give you pause. 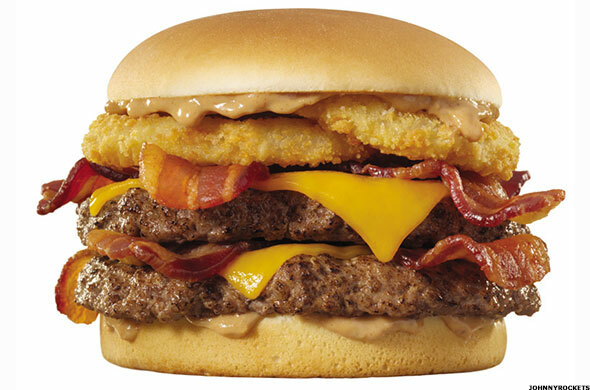 The Smokehouse Double, one of the most famous offerings at Johnny Rockets, contains two beef patties, bacon, onion rings, cheese and smokehouse sauce. The meal packs 1,660 calories, a whopping 110 grams of fat and 2,660 milligrams of sodium. It's delicious but costly. Chicken and cheese. How could this go wrong? Very easily, when you consider the 1,830 calories, 92 grams of fat and the absurd 4,300 milligrams of sodium. This is a great option if you want to consume multiple days' worth of sodium in one sitting. Otherwise, move on. Look, we're all for home style cooking. We're just not sure IHOP is the place to go get it. 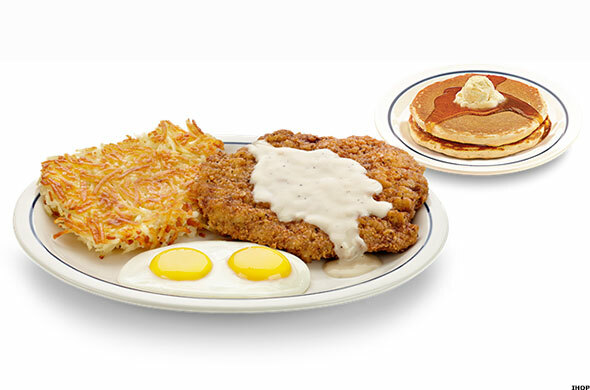 The country-fried steak offering from the pancake house contains an eight-ounce fried beef steak coated in country gravy that comes with two eggs, hash browns, and two buttermilk pancakes. Altogether, this dish totals 1,850 calories, 114 grams of fat and 4,550 milligrams of sodium. If you have a hankering for Southern cuisine, maybe wait until you're actually down South. 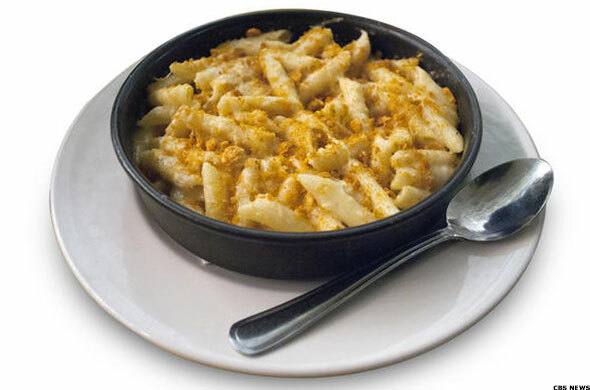 What is it about the pasta and cheese combination that lands it on this list so often? 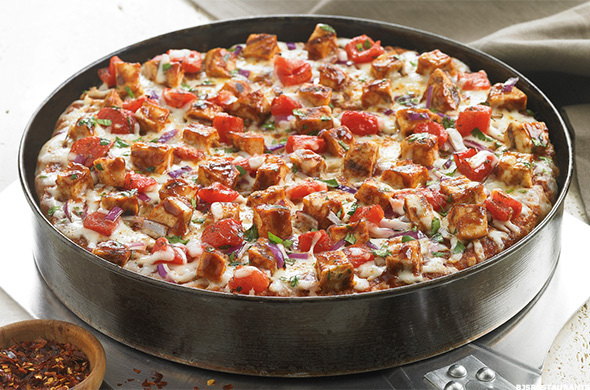 This offering from Uno's, famous for its deep dish pizzas, contains 1,980 calories, 71 grams of saturated fat, 134 grams of total fat, and 3,110 milligrams of sodium. 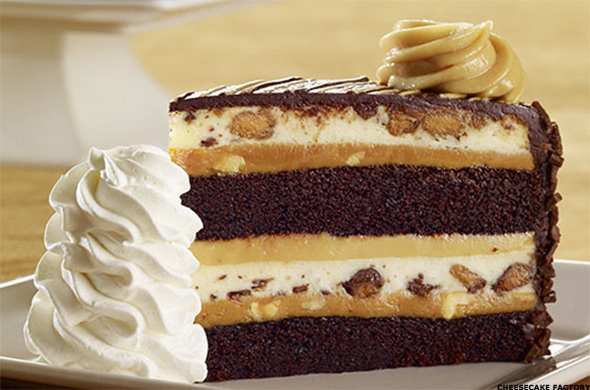 Prepare to see The Cheesecake Factory on this list. A lot. 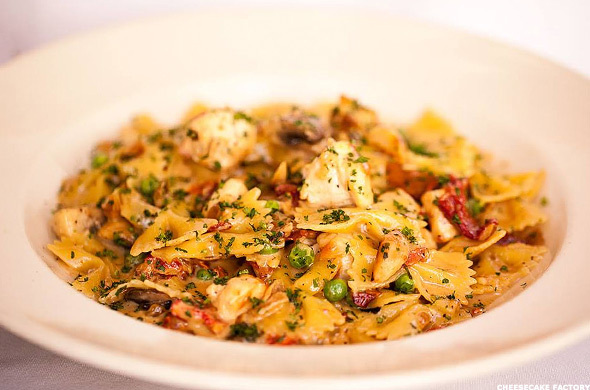 Understandably, you probably think of cheesecake when you hear "The Cheesecake Factory," but the numerous entrees on the menu can do some serious damage, as well. 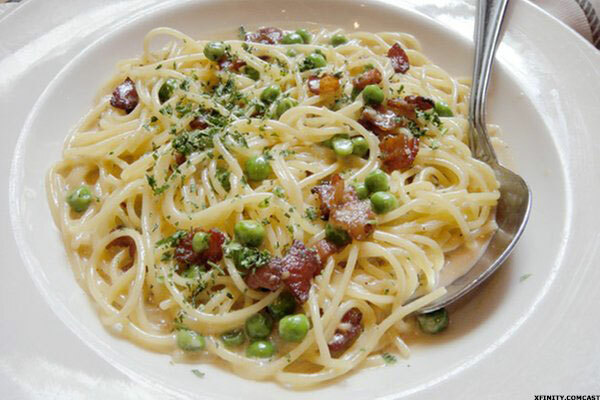 This pasta carbonara, while delicious, is particularly troublesome. One order totals 2,290 calories, 81 grams of saturated fat, and 1,630 milligrams of sodium. 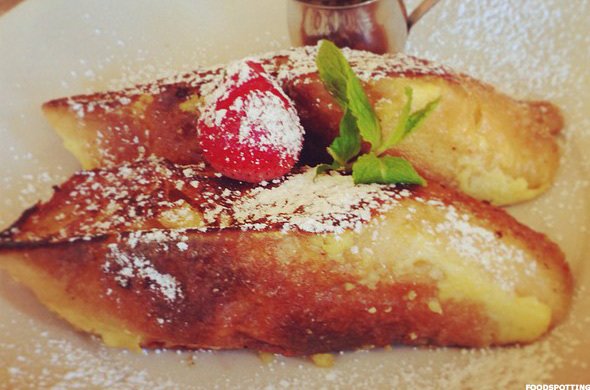 The menu, which is basically an encyclopedia, describes this as "the best french toast ever!" And it very well could be, but not once it hits your stomach. This breakfast treat contains 2,780 calories, 93 grams of saturated fat (almost a full work week's worth), 2,230 milligrams of sodium, and 24 teaspoons of sugar. Oh, and you can also add an optional side of bacon or ham for an extra 200 calories. CSPI points out you'd need to swim laps for seven hours to burn off this one meal. This is the equivalent of eating 14 slices of Aunt Jemima frozen Homestyle French Toast stuffed with 2.5 eight-ounce tubs of Kraft Philadelphia Original Cream Cheese Spread. Say it with me. "Reeeeeeed Robin...yuuuuuuuummmm!" It's a catchy jingle, but let's see if you're still singing it after you find out what's in this meal. The burger contains hardwood-smoked bacon, melted Pepper Jack cheese, A.1. Peppercorn Spread, tomatoes and crispy onion straws. All of this is on a 6 oz. beef patty, but you can add another for just $1.99 to bring the total up to 1,670 calories for the "Monster" burger. You also get unlimited steak fries at 370 calories per serving. If you add a Monster-sized Salted Caramel Shake, you get another 1,500 calories and two days' worth of sodium. Altogether, you'd consume 3,540 calories (nearly two days' worth), 69 grams of saturated fat (3.5 days' worth), 6,280 milligrams of sodium (four days' worth) and an estimated 38 teaspoons of added sugar (mostly from the shake). That's the equivalent of eating seven McDonald's (MCD - Get Report) double cheeseburgers with a quart of Coca-Cola (KO - Get Report) . CSPI says you'd need to take a 12-hour walk to burn off the calories. 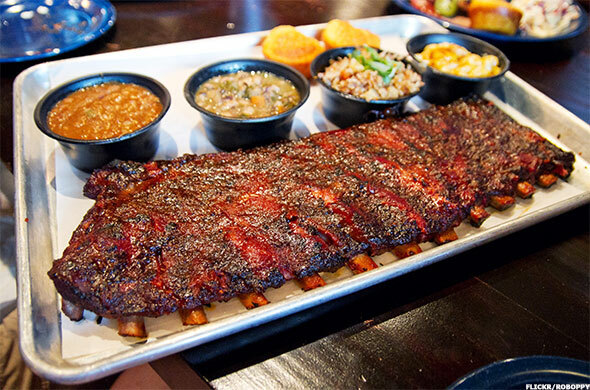 Each Big Slab contains 1.5 pounds of meat, which is a daunting enough task. But then you get two sides and a corn bread muffin. If you elect to eat the Famous Fries and baked beans, you'd consume 2,770 calories (more than a day's worth), 54 grams of saturated fat, 4,320 milligrams of sodium and 14 teaspoons of sugar. CSPI's exercise recommendation is 7.5 hours of mowing the lawn to work off this meal. This chain offers 11 different pizzas, but this 9-inch choice is by far the winner in the unhealthy category even though it's smaller than the typical 11-inch at the restaurant. The pizza contains grilled garlic chicken, applewood smoked bacon, jack cheese, cheddar cheese, red onions, diced tomatoes and ranch dressing. This pizza in a pan contains 2,160 calories, 30 grams of saturated fat, and 4,680 milligrams of sodium (three days' worth), so you'd need to pedal on a bicycle for 5.5 hours without stopping to counteract this one meal. This is the equivalent of eating three Pizza Hut Personal Pan Pepperoni Pizzas. 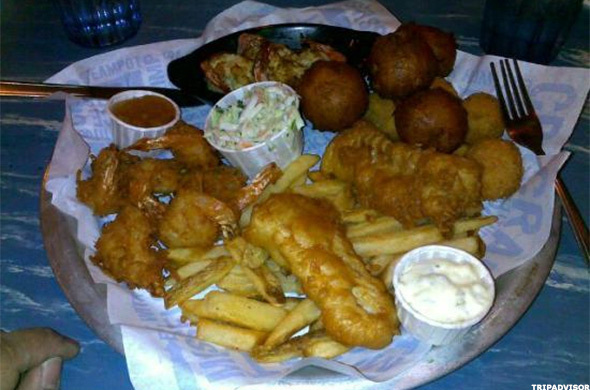 Chevys serves up a whole lot of food in this platter, so let's dig into it. 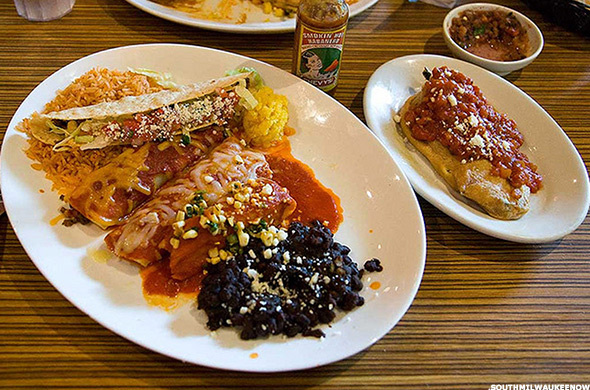 The combo contains one beef enchilada, one chicken enchilada, choice of a crispy or soft Beef Taco, a pork tamale and a Chile Relleno. But wait, there's more! You also get rice, a corn tamalito, and a choice of beans a la charra or refried beans made with bacon or vegetarian black beans. This all amounts to 1,920 calories, 36 grams of saturated fat, and 3,950 milligrams of sodium. That's the equivalent of 11 Taco Bell crunchy tacos. And this is before you factor in the free chips and salsa Chevys brings! To work this off, CSPI suggests 3.5 hours of singles tennis. 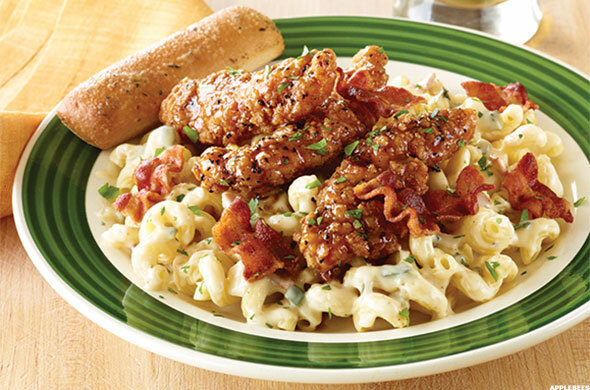 Pasta with chicken and garlic can't be that bad for you, right? Even with the cream sauce? Guess again. This dish contains 2,410 calories, 63 grams of saturated fat (three days' worth) and 1,370 milligrams of sodium (slightly less than a day's worth). That's the equivalent of five frozen single-serve packages of Stouffer's Classics Chicken Fettuccini Alfredo with a pat of butter on each. CSPI recommends a five-hour jog to burn off this meal. This offering from the seafood chain features seafood and crab balls filled with jalapenos and cream cheese, then coated in panko breadcrumbs and served with ranch dressing. But we're just warming up. You also get fish and chips, which the menu describes as "flaky white fish hand dipped in a classic Samuel Adams beer batter served with fries." Add to that some coconut shrimp with apple-plum dipping sauce, crab-stuffed shrimp, hush puppies and coleslaw. The platter contains 3,280 calories (1.5 days' worth), 50 grams of saturated fat and a staggering 7,610 milligrams of sodium (five days' worth). This one dish equates to two of Red Lobster's Admiral's Feasts, which contain fried shrimp, scallops, clam strips, and flounder. But you'd also have to add in french fries and cheddar bay biscuits to match the calorie count, and you'd still have less than half of the saturated fat. CSPI's exercise solution for this one is 11 consecutive hours of golf, without a cart or a caddie. 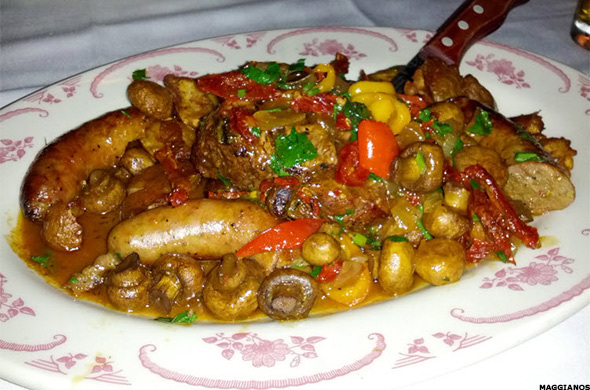 This chain allows customers to order any steak Contadina Style, which adds on two Italian sausages, crispy red Vesuvio-Style potatoes, roasted red and yellow peppers, roasted mushrooms, caramelized onions, sun-dried tomatoes, steak jus, and garlic butter. So what happens when you add all this to the Prime New York Steak? You get a meal of 2,420 calories, 66 grams of saturated fat (more than three days' worth), and 5,620 milligrams of sodium. The steak alone is 1,250 calories, the equivalent of five Quarter Pounder beef patties from McDonald's. Add on the Contadina trimmings and you get another 1,170 calories, or four Quarter Pounders and a cheeseburger. To work off this meal, just get on the rowing machine for 7.5 straight hours. This list ends, appropriately, with dessert, and the final entry from The Cheesecake Factory. This devilishly rich treat packs 1,500 calories, 43 grams of saturated fat and 21 teaspoons of mostly added sugar. That equates to one four-serving, 17 oz. frozen Sara Lee Classic Original Cream Cheesecake with a cup of Breyers chocolate ice cream. CSPI suggests 4.5 hours of aerobics to work off this dessert. Did your favorite restaurant and/or meal make the list? Are you surprised by any of the entries? Let us know in the comments section.